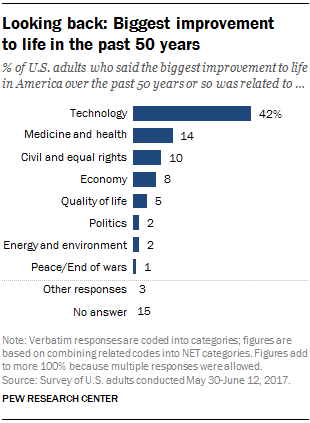 When Americans are asked what has brought the biggest improvement to their lives in the past five decades, they name technology more than any other advancement. And as Americans think about the next 50 years, they expect that technology, along with medical advances, will continue to have a major impact, according to a Pew Research Center survey conducted May to June of this year. The past 50 years have seen major changes in the U.S., from rapid social change ushered in by the civil and equal rights movements of the late 1960s, to biomedical innovations leading to increased success with human and artificial organ transplantation, to the emergence of the information age. 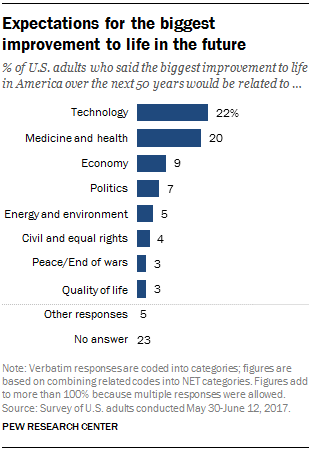 In an open-ended question, respondents were asked, “What would you say was the biggest improvement to life in America over the past 50 years or so?” Technology was cited most (42%), while far fewer respondents mentioned medicine and health (14%), civil and equal rights (10%) or other advancements. Technology was identified as the biggest improvement by whites (47%) and Hispanics (35%), while blacks were about as likely to name technology (26%) as they were civil and equal rights (21%). The public’s perception that the technological revolution has had a lasting impact on American society can be seen in other Pew Research Center studies – notably, a 2016 survey where 22% named the tech revolution as one of the most significant historical events in their lifetimes, behind the Sept. 11 attacks and the election of Barack Obama, the first black U.S. president. A separate 2016 survey found 52% of Americans judge technology to have had a generally positive effect on society overall, with many citing the ways in which technology improved the ease, speed and convenience of sharing information. Another open-ended question in the same 2017 survey asked Americans to predict the biggest improvements to life over the next 50 years. The top responses were expected improvements from technology (22%) or from medicine and health (20%). Expectations for biomedical and technological advancements are in keeping with a 2016 Pew Research Center survey in which 81% of U.S. adults said they fully expected artificial organs to be routinely available for transplant, 66% said that most forms of cancer would probably be cured and 48% said humans would definitely or probably use implanted sensors to monitor or adjust all food and medications that enter the bloodstream in the next 50 years. Note: Methodology can be found here, and question topline can be found here.